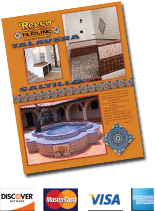 Properly boxed and packaged regular 12x12 square Saltillo clay tile stained soft brown (color may vary from picture). Sold per piece. It is one piece per sq. ft.